As the photoblogger on this team, meaning the person who blogs and also manages the Instagram, part of my job is to see the pretty cool things on or around campus. If you’ve been following along with my eyes and perspectives on the ‘Gram, you would notice that a huge portion of my photos are of landscapes and sometimes people. 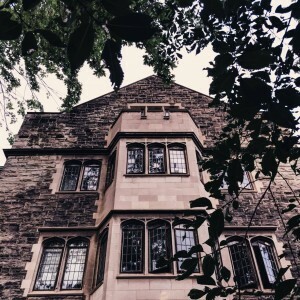 As midterm season rolls in with the dropping temperatures of autumn, I’ve decided to share my top four favourite places to visit on or around campus for destressing, procrastinating, fire Instagram photos, or sipping tea while you Snapchat. A very cool spot on campus where you can see the CN Tower framed perfectly by the trees. This one might seem a little obvious. You’ve probably walked around this circle a hundred times to rush to Med Sci, or Con Hall, or even snuck in a few hours to toss around a football or Frisbee on the field. 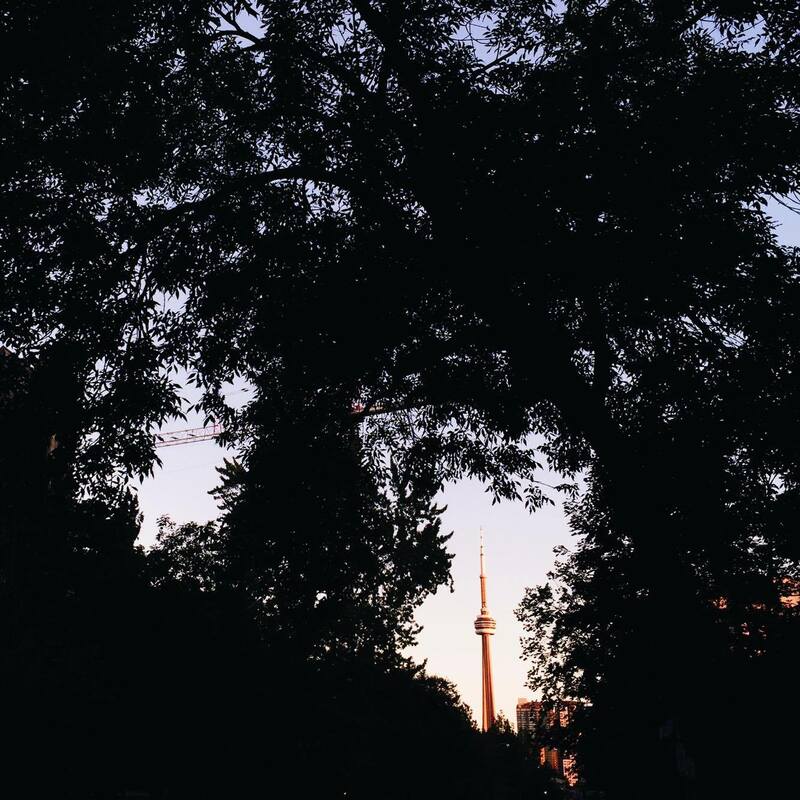 But at dusk, when the sky turns shades of navy blue to purple, and the buildings are silhouetted from the sinking sun, King’s College Circle becomes magical. The threatening pillars of Con Hall become glowing embers in the distance, a hearth in front of a huge dome. Looking southbound sees the CN Tower in its full glory, lit up with whatever colour(s) it fashions. One of my favourite places to think. 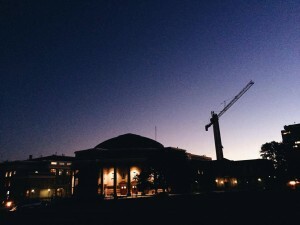 How is it that such a giant building transforms so much when the sun sets? As a UC student, I’ve spent quite a lot of time in this quad. I wouldn’t be honest if I didn’t put it down on this list – the UC quad is one of my favourite places to sit and breathe when essays pile up. When entering the quad, it feels as if you’re entering a forest hidden away inside a castle. The trees and leaves are drooping shades of yellow, orange, and red. The arches provide nice shelter from the cool winds. I recommend listening to The Paper Kites to compliment this experience. 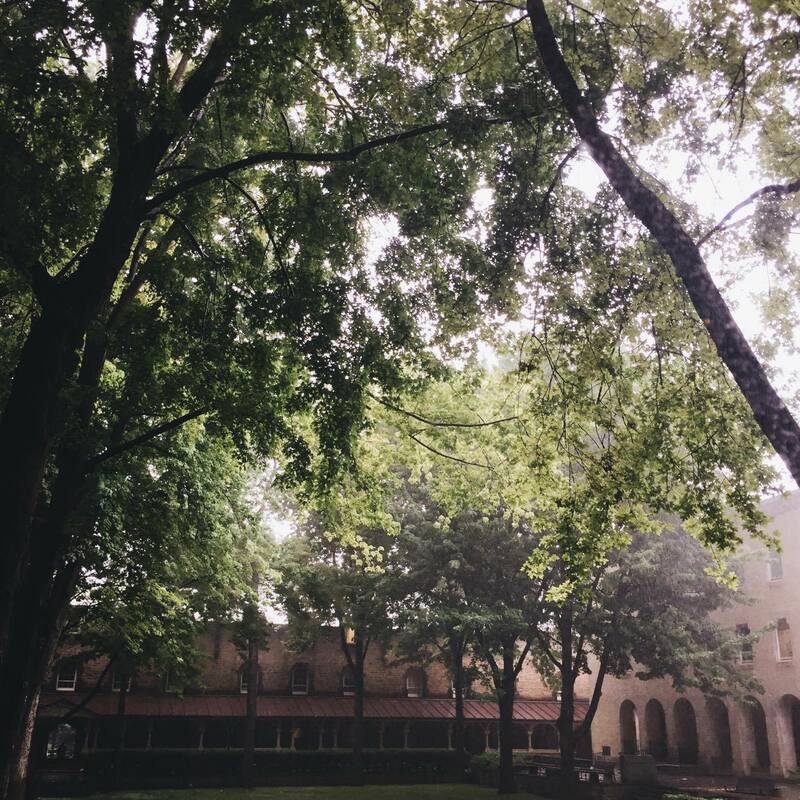 Misty, rainy days in the Quad when it was still green. This area requires a little bit of walking or a quick streetcar ride. 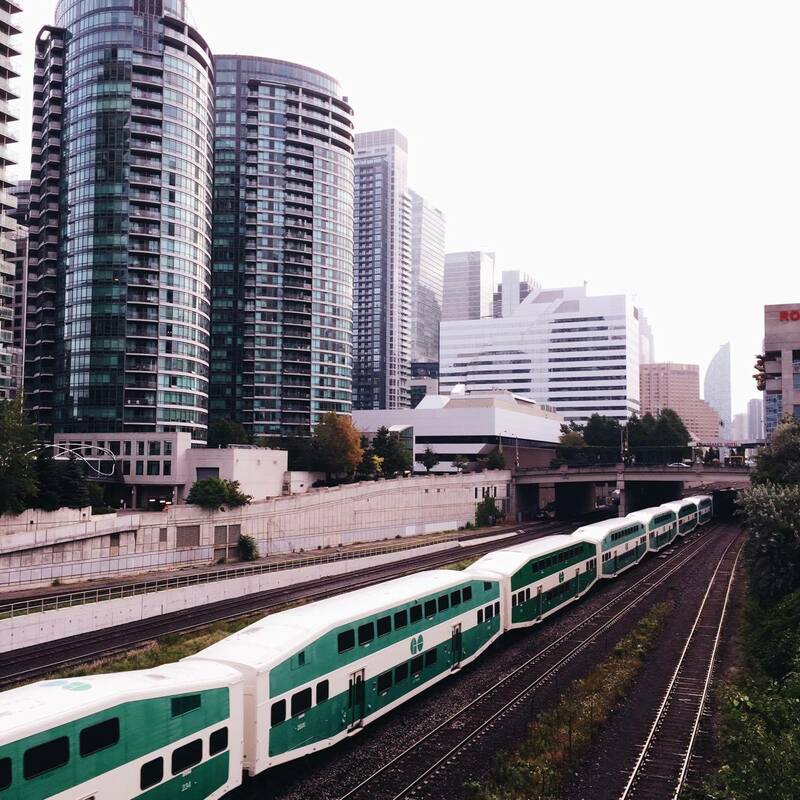 However, when you get here the view is worth it: you can see the trains rolling in like emerald streaks while you sit on the benches or lean on the railing overlooking them. As they pull in, the wind from their arrival swishes your hair around, setting a Tumblr/picturesque tone to whatever phone shots you want to take to distract from the fact that you’re not doing your essay. It’s also a fantastic place to think. I realize now that most of these places I’m mentioning are places where I think a lot, so I encourage you to try the same and embody an existential young person like I do. One of the hidden (no longer) gems of the city. The mysterious Knox College is on St George, in between the engineering district and central University College. With its stone exterior, looming presence, and Presbyterian title, it stands as a little intimidating to newcomers or those hurrying past to make it to class. However, once you go inside, I highly recommend you visit the walkway inside the doors. It’s truly a fairy-tale location, with a white outdoor corridor, blooming flowers around, and light streaming in from the open air. Knox College with its stone walls. I hope you take the time to explore from this selection of places I’ve visited and let me know your perspectives on it! 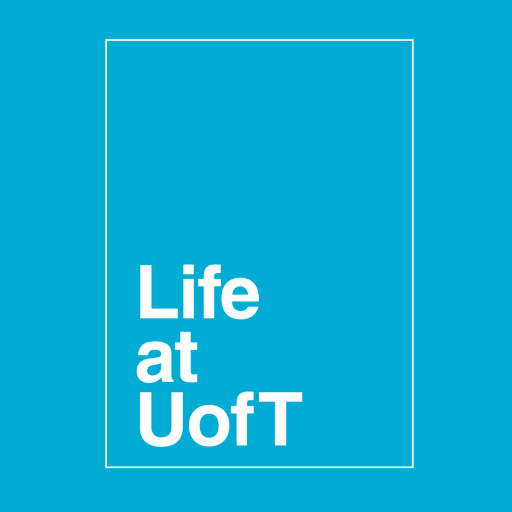 Send the lifeatuoft instagram a DM with your photo and I’ll repost my favourites!